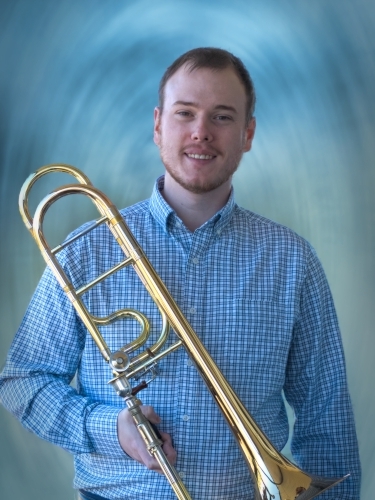 Jamey Morgan is a trombonist currently finishing his Master of Music degree at Michigan State University. A versatile musician, Mr. Morgan is an active performer on alto, tenor, and bass trombones, performing in several Michigan chamber ensembles and orchestras. He is also a member of The Breakfast Club, a trombone quartet founded at MSU. Mr. Morgan has been a participant at the Cleveland Trombone Seminar (2017 and 2018), the Third Coast Trombone Retreat (2018), and performed with the inaugural Big 10 Honors Trombone Choir at the 2018 International Trombone Festival. Mr. Morgan is also experienced in the medium of drum and bugle corps, performing with the Blue Knights from 2012 to 2015, twice as a soloist. Mr. Morgan received his Bachelor of Music degree from the University of Colorado Boulder and a Professional Performance Certificate from Penn State University. His teachers include Ava Ordman, Mark Lusk, and Dr. William Stanley.